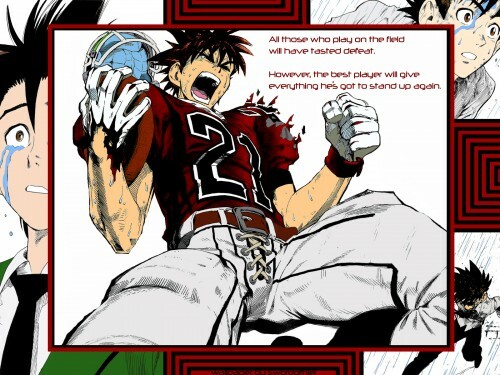 After re-reading the game between the Devilbats and the White Knights, and after seeing that awesome two page spread of Sena when he scored his Shin-defying touchdown, I knew I had to color it and make it into a wallpaper. I also knew that since this was one of the moments in the series where the contrast between the early, timid Sena and the passionate, experienced football player he had become really shined, I wanted to emphasize this in my wallpaper. I did that by coloring and cleaning the three background scenes, all of which are from the chapter 20 'Epilogue of Prologue', which is the chapter where Sena decides to commit himself to American football. The bold placement of the main image over the three background images, and the way it covers part of them, serves to show how Sena has smashed his old, weak self image to become the dedicated athlete he is. The coloring of the center image took me quite a while, since I had to redraw and clean a lot of it; I might have taken some liberties with his pants, but I think it came out pretty good :) Another thing to notice is how I colored his skin differently in each scene, going from light and peachy when he was crying to rough and tanned in the center, when he has become a true football player. Please enjoy! I was looking for Eyeshield 21 wall. and i find this cool wall of Sena.